1) Assume the US economy is in recession. 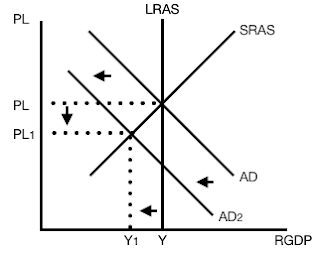 (a) Draw a CLG of the LRAS, SRAS, and AD curves, Show each of the following. 2) Now assume the Euro-Zone, a major trading partner of the US, enters into a recession. (i) What will be the effect on US exports to the Euro-Zone? Explain. The effects of a recession in the Euro-Zone will lead to less US goods being purchased by Euro-Zone citizens. 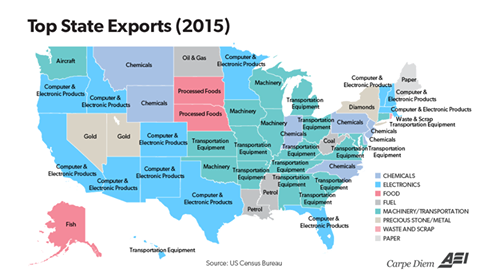 Less purchase of goods from the US means that the US exports will decline. 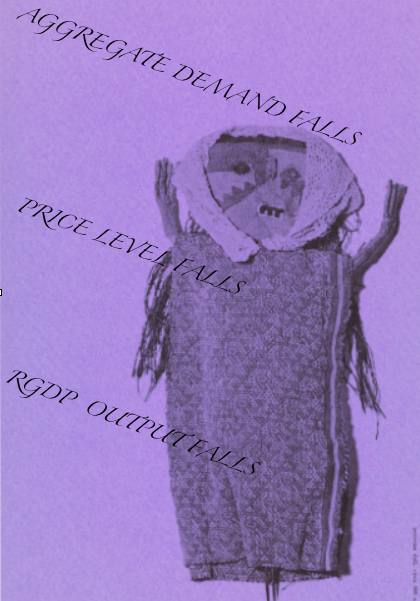 You could also talk about prices of goods will fall during a recession in the Euro Zone and therefore Euro citizens will find their own goods relatively cheaper or that aggregate incomes in the Euro-zone will fall and that will make the US produced goods relatively more expensive therefore less will be purchased from the US. If US exports decrease then AD shifts left. 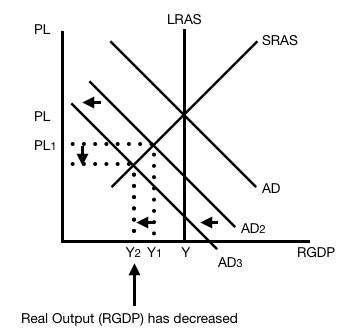 (ii) On your graph and part (a), show, the effect of the change identified in part (b)(i) on real output in the US. (iii) What will be the change in identified in part (b)(ii) on unemployment in the US. If countries don't buy our stuff (exports fall) then AD will decrease, the US slides further into a recession and a recession is characterized by a lower PL, less output, and higher levels of unemployment. 3) Assume the Euro-Zone recession causes a decrease in demand for US dollars in the FOREX. (i) Will the euro appreciate, depreciate, or remain unchanged against the US dollar? Explain. If the Euro-Zone isn't demanding our goods then the demand for US dollars is decreasing. If the demand for US dollars is falling then the value of the US dollar must be depreciating. That means that the Euro must be appreciating relative to the US dollar. 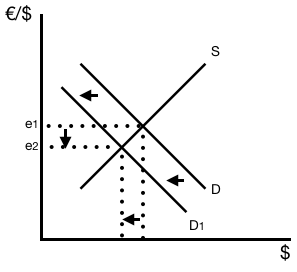 (ii) Draw a CLG of the FOREX for $ dollars, and show the decrease in demand for dollars on the exchange rate for dollars. 2) the number of Euro's it takes to buy 1 US dollar is decreasing, meaning that the Euro's value must be appreciating. D) Assume the US implements expansionary monetary and fiscal policies. In the absence of complete crowding out, what will be the effect of these policies on each of the following? (i) Aggregate Demand in the US - Aggregate Demand will increase because of the expansionary monetary and fiscal policies. (ii) Price Level - The price level will increase, as AD shifts rightward due to the expansionary policies the PL will increase. (iii) Interest Rates in the US - Understand that as the US Government uses expansionary fiscal policy (GS increases or Taxes decreased) the (RIR) Real Interest Rate will increase and as the FED uses expansionary monetary policy (Buys Bonds, decreases the (RRR) Required Reserve Ratio, or the (DR) Discount Rate) the Nominal Interest Rate will be increased as the (MS) Money Supply increases. Monetary & Fiscal Combo effects cheat sheet here.